It was 29th May 2016. The stage was set for the two teams who were looking to win their maiden IPL title. Royal Challengers Bangalore (RCB), led by Virat Kohli versus Sunrisers Hyderabad (SRH), led by David Warner. SRH had won the toss and managed to put a massive 208 runs on board courtesy David Warner and Ben Cutting’s blistering Knocks of 69 and 39* respectively. RCB started their chase with confidence thanks to their openers Chris Gayle and Virat Kohli who were hitting the ball out of the park. RCB was cruising towards the win when they were at 114 runs in the 10th over without any loss of a wicket. And then it happened. Gayle got out on 76 followed by Virat Kohli and AB de Villiers. All of this happened within the space of 20 balls and RCB who were in a strong position suddenly found themselves needing 61 runs off 37 balls. The other players of RCB did try their best to win the finals of the 2016 IPL, but could only manage to score 200 runs in 20 overs and therefore handing SRH their maiden IPL Champions title. RCB lost the final for the third time with their dream of winning the IPL Trophy still unfulfilled. This incidence is not something new to RCB. The star-studded team has over the years found itself in similar situations on many occasions. They get themselves in a winning position, and one wrong move and all of sudden they fall like a pack of card. So what is the reason that RCB despite having star power over the years, has failed to win the Cup even once? Let’s try to understand. Most of the times, RCB had failed to acquire players who would give the team an overall balance in the squad. They often tend to target three to four-star players by buying the likes of Tillakaratne Dilshan, Zaheer Khan, AB de Villiers, Daniel Vettori, Muttiah Muralitharan, Chris Gayle, Yuvraj Singh, Shane Watson, etc. And then the Team Management would then somehow manage to fill other players around the stars, hence compromising on the right balance of the squad. On the other side, teams like Mumbai Indians and Chennai Super Kings, who although are loaded with star players, make sure that they get highly competent domestic players who eventually compliment and rally around the star players. Apart from two or three occasions in IPL history, RCB has struggled to get the stock of match-winning National players. It goes as a reason that they need to target players who are reliable and proven match winners at domestic circuits. And local players from different states performances in India who have scored runs and taken wickets consistently. A team like Sunrisers Hyderabad has a good amount of back up players who can fit into the playing eleven at any given time. And this is something which glaringly lacks in RCB. It’s a common thing to see the playing eleven change in every match in IPL due to different conditions and oppositions. That’s why all the teams are looking to define the most ideal combination which could win matches for them on a consistent basis, more importantly in the first half of the tournament. Once the perfect combination of a balanced playing eleven is identified, most of the times the Team Management stick to the same eleven until the conditions are entirely different. But RCB has failed on many occasions to find the ideal eleven which works for them. Also as we know that Virat Kohli is a sort of a reactionary captain and how much he likes chopping and changing the playing eleven (as seen with the Indian test team), he at times gets very radical and experimental with his decisions. You might say that he is not the one who is completely responsible for team selection. Agreed, but given the fact that we are talking about someone who leads Team India, it stands to reason that the major calls in the selection are taken by him. The constant dropping of players does no good the team’s confidence and morale. The scepticism affects their performances and hence they are not able to contribute as much as they would like. 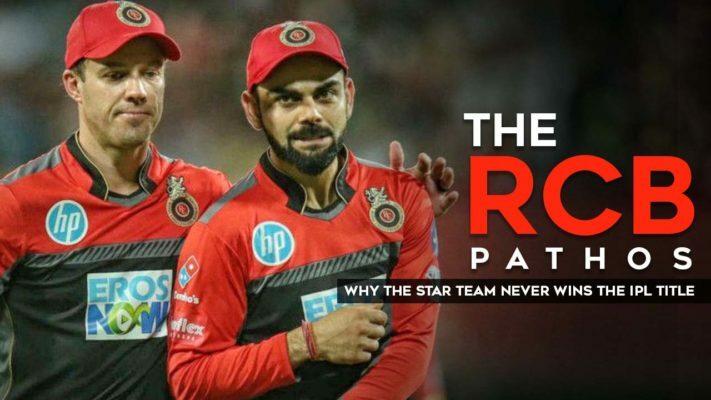 Another factor which has backfired RCB is that they have often relied heavily on their star players to come good especially the likes of Virat Kohli, AB de Villiers and Chris Gayle (in the past seasons). There are many occasions when the team has been in a good position and when one of these players fails, they crumble down. For example, during IPL 11 (2018), in a match against Rajasthan Royals (RR), RCB had to chase down 164 runs, that too in 15.5 overs to overcome Mumbai Indians in the net run rate and qualify for the playoffs. But slowly the match started going away from RCB’S hand when they lost Kohli in the third over. A promising partnership between Parthiv Patel (33) and AB de Villiers (53) raised their hopes of at least winning the match if not the net run rate. But once Patel got out, de Villiers found no support from the middle-order and there was complete mayhem. Moeen Ali, Mandeep Singh and Colin de Grandhomme were dismissed cheaply. The pressure of staying up with the increasing net run rate had piled up on de Villiers and his dismissal in the 13th over was the final nail in the coffin for Bangalore. During the post-match presentation, Kohli even said that the other batsmen needed to take up some initiative and it was not fair to leave the pressure of scoring only to de Villiers. “It was a strange one; we were in a great position at one stage but the way we fumbled it wasn’t ideal. AB was batting beautifully; the decision-making of the others was poor. It shouldn’t have been repeated by five, six guys in a row. We wanted to strengthen our middle order. That hasn’t been our strength for the last few years and it’s something we need to look forward to over the next year and beyond. Scoring and stress in the middle order can’t always be on a guy like AB. Here, others around him just didn’t show enough composure,” – Virat Kohli said, as quoted by India today. Due to the heavy reliance on the star players, most of whom are batsmen, RCB depends heavily on its batting to come good and win matches for them. They have tried many players to strengthen their batting and somewhere has not focused equally on getting good bowlers who can win them the matches too. Take this season (2019) for example; they have Umesh Yadav, Mohammad Siraj, Navdeep Saini, Pawan Negi etc, who are decent bowlers but not match winners. Apart from Chahal and Southee, they don’t have proven match winners bowlers. Over the years, it has been RCB’s strategy to go batting heavy making the bowling look weaker. I agree that cricket has been a batsman favouring game but over the years that has changed. You need really good bowlers to win you a match especially in the shortest form of the game. This is something, I feel the RCB’s Team Management has to realize, sit back and reform their strategy. Personally, I am a huge fan of both Virat Kohli and AB de Villiers and its sad to see them losing year after year. It’s unfair that despite possessing such star power they didn’t even win the IPL trophy once. Even this year has started on a bad note for them, but I hope they bounce back and come back strongly. Wishing the team RCB all the very best. Hopefully, this year will finally be the one which will break their jinx. Cheers.